And so the skirt story continues… This fabulous little number is the 2nd of the wiggle skirts to be made from the same basic pattern. This one & Barbara share the same bones, only the pocket treatments are different. And this one is 4cm longer. The fantastic fabric was a purchase from Rosenberg at the Sewing Show in Birmingham earlier this year & we love the colour! 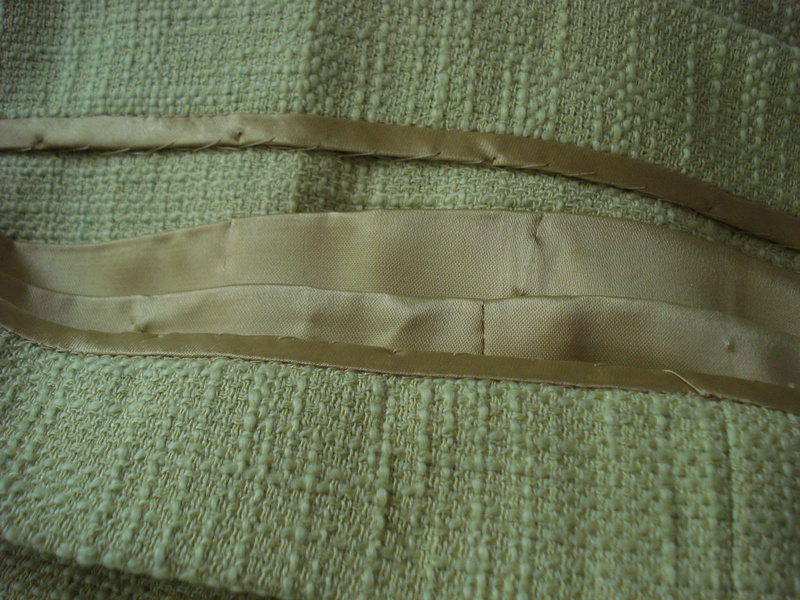 The lining is in a similar colour from Fred Winter in Stratford on Avon. So unfortunately this doesn’t count as a stash busting project as I bought the fabric this year, but it is only the 5th project I’ve specifically bought fabric for – out of a total of 50 projects of all sorts completed so far this year, I think that’s pretty good going! I’m not counting the fabric I need to buy for the Etsy shop items though, that would be unrealistic! Barbara on the left & Veronica on the right. 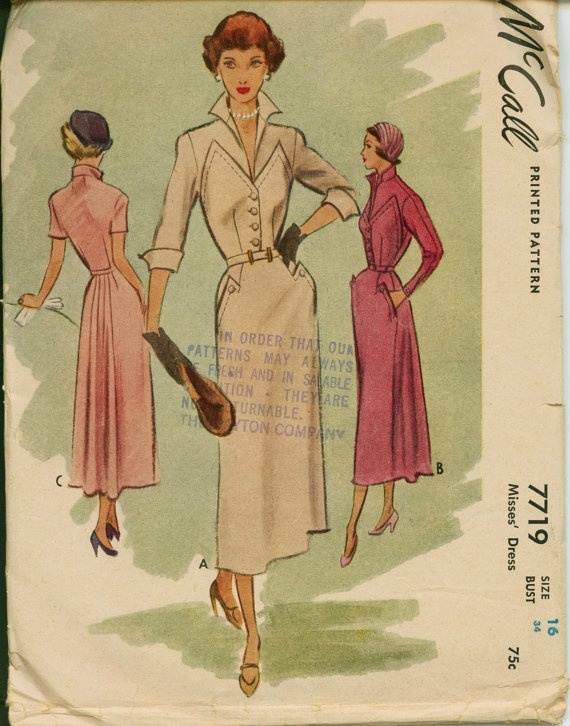 Veronica was “inspired” by a rather fabulous late 1940’s dress pattern I’d seen on Pinterest. 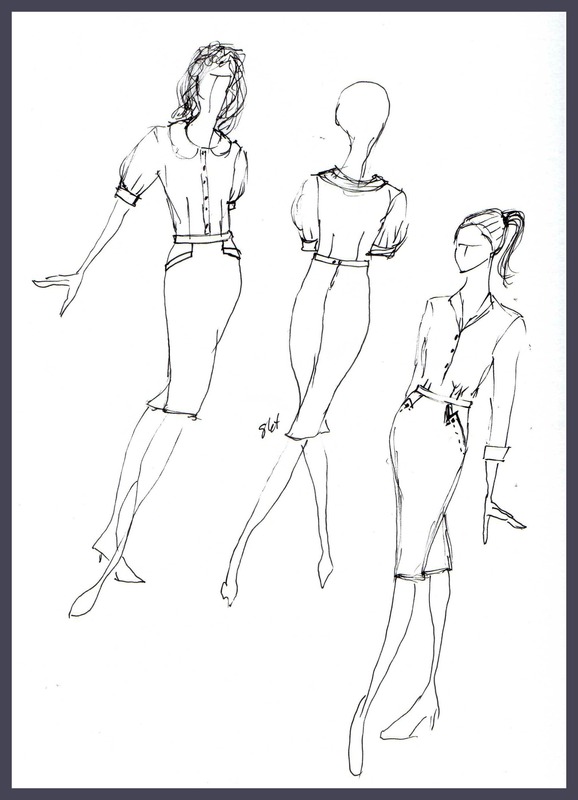 It has some really interesting style lines, but I loved the pocket treatments on the skirt. Again, I used the dart as a seamline and created the pockets from there. The dart needed to be moved over towards the centre a bit, & angled further to create the right line. I drew it all on the pattern in pencil to start & ran up a quick toile to check the angles, then drew all over the toile to correct the shape! This is what the final pieces ended up looking like… Sorry it’s all a bit fuzzy, darned mobile camera is not the best. I will definitely do a tutorial on how to make both Veronica & Barbara in the next month or so, so if you’d like to make a skirt like this for yourself, follow the instructions to draft & fit a basic skirt block so you’re ready! Bound hem hand stitched in place. Love the skirt! And the details you got perfect. Beautiful make. I can’t wait for the tutorial on making that pattern! It’s gorgeous. Fantastic skirt! I’m looking forward to the tutorials. Oooh i love it!! I’m so glad you showed closeups because the texture of the fabric really makes it extra special. Love the pockets!!! Yes! A success for sure. The pockets are fab. Definitely a great success. And a beautiful model! This is just gorgeous – the colour, the fabric and I love your finishing! 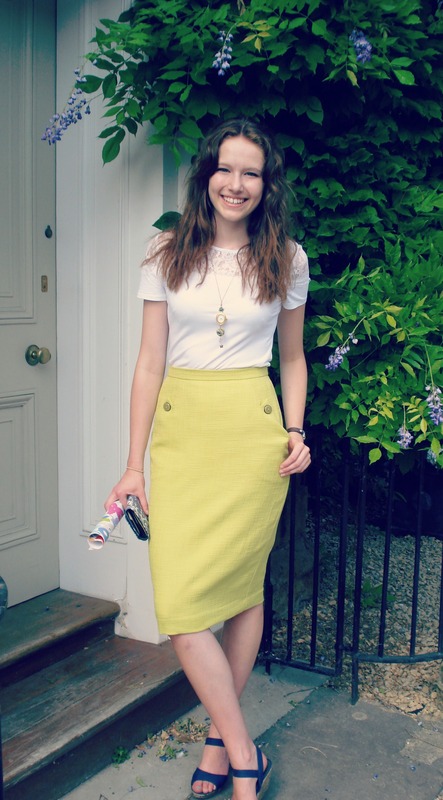 I tend to finish hems the same way – it’s neat, tidy and looks pretty. 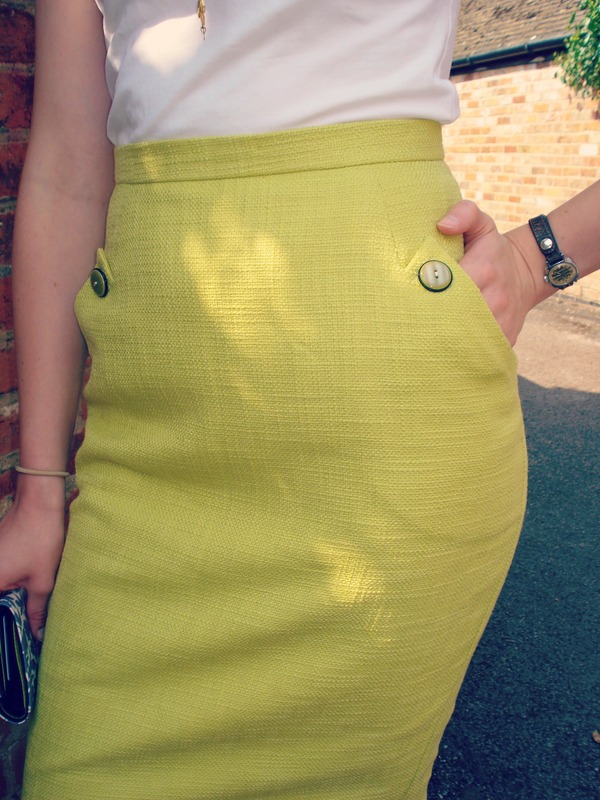 I love the colour and texture of that fabric – and it loos fabulous as this skirt. Your daughter looks like she would agree! Beautiful fabric. The finishing is great! That is another wonderful skirt. Your drafting changes makes sense. Thank you for sharing this! Love the pocket feature and the colour is gorgeous. The yellow is such a happy color. That fabric is divine!! I love wiggle skirts. The combination is a dream. I think this skirt is on of those wardrobe staples that you could wear a ton of different ways. The skirts look so lovely on your daughter. Thank you for being so generous in doing a tutorial as I’d love to try the pockets you’ve created. 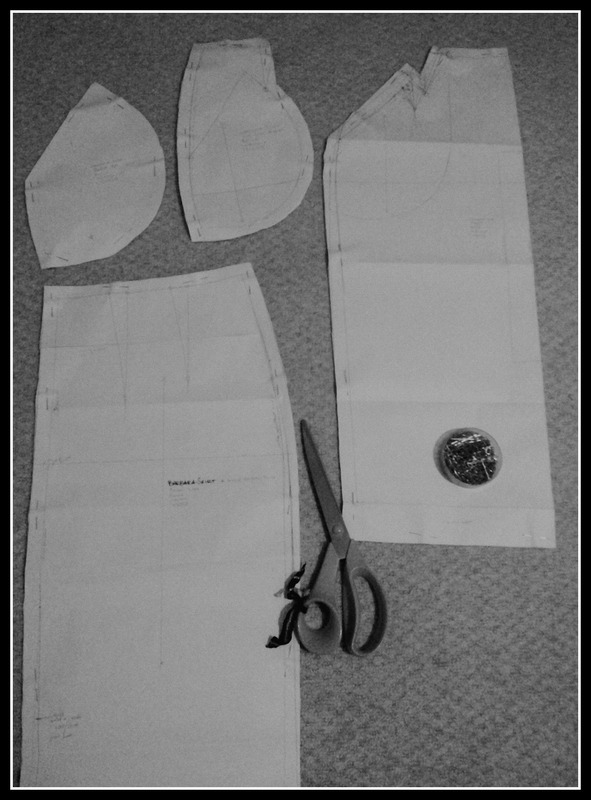 I’m going to make a start on drafting a skirt block today, in readiness. Oh my, this is truly beautiful skirt! It suits your daughter perfectly and the color, gorgeous! You did a great job! Wow I love it its so gorgeous!! Love the fabric too!! Fantastic skirt! Can’t wait to read on and learn how to create my own version. I love the recreation of the details from the inspiration pattern.